Here is the sunset at Haleakala which can be spectacular in its own way. While not as nice as the sunrise (see our sunrise photo) it is still a sight to see and feel as the temperature rapidly drops. It also saves waking up at 3 or 4am to make sunrise. Plus there is a better chance of a sunset view. Hope you enjoyed our look at Haleakala. The last couple photos are spread off since I’m taking a quick vacation and where do Hawaii people go for vacation.. Vegas of course. We still have the spectacular Superferry ride back to Oahu which will complete our Maui series and I may even sneak in some Vegas pictures since some people do call it the 8th island. 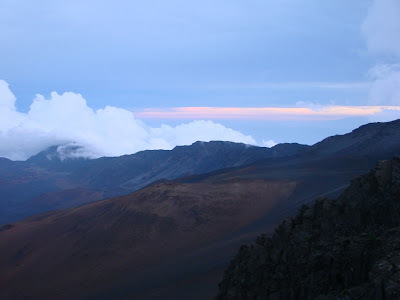 Here’s another great shot of Haleakala near sunset. It was eerie watching the clouds start to roll in across the caldera. I have a feeling it was some of the same clouds we drove past on the way up to the summit which is 10,023 feet above sea level. Plan your time accordingly for sunsets and sunrises as it does take about an hour or so from the park entrance to the summit depending on the conditions. 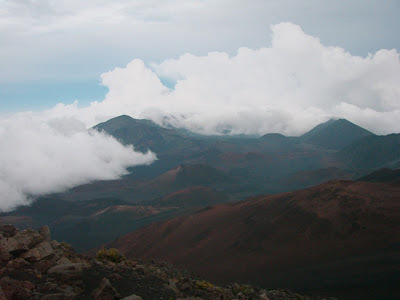 This is a picture from one of the scenic viewpoints near the summit of Haleakala. Its actually not really a hike but a short walk I think total of less than a half mile roundtrip. If you have time its a nice walk to casually do but we were racing sunset so I had to half jog to get to the viewpoint. Well worth the view. 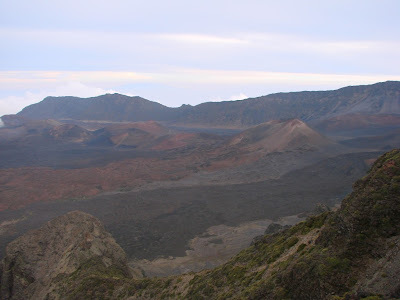 Interesting note on the Haleakala “crater” it is not believed to be volcanic in origin but scientists belive it was formed when the headwalls of two large erosional valleys merged at the sumit ththe volcano.